THE KREE EMPIRE COMES TO EARTH! 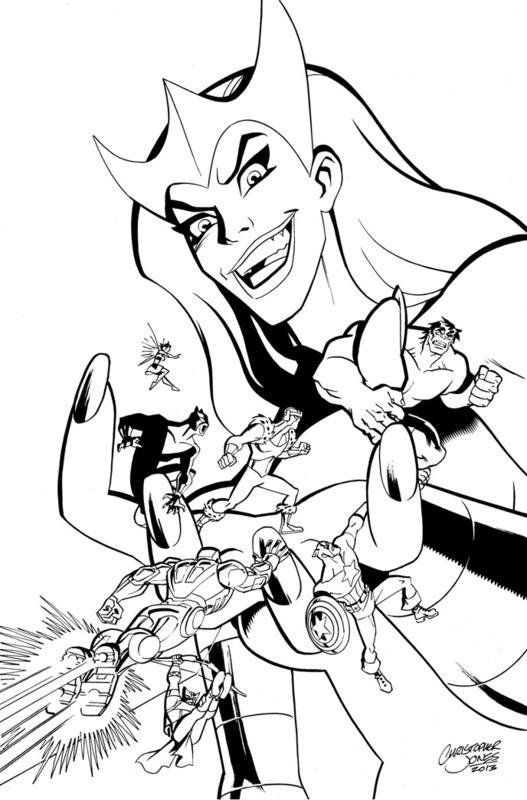 Ms. Marvel joins the Avengers against Ronan the Accuser. 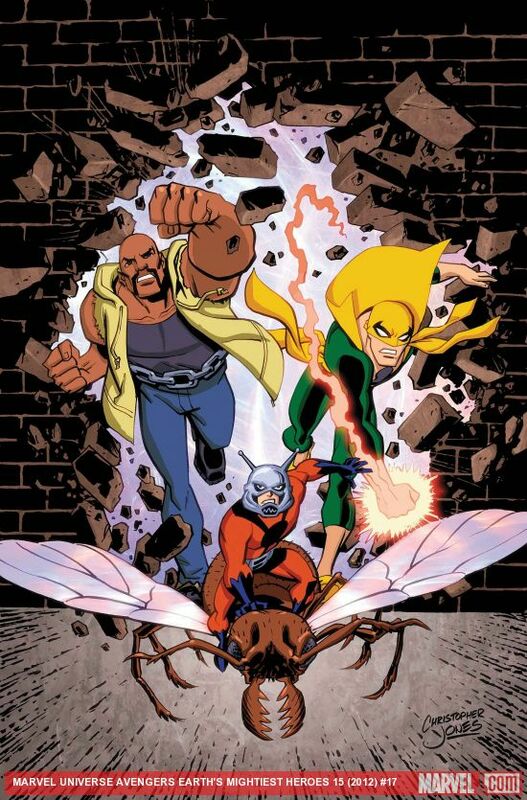 Based on season two of the hit Disney XD TV show! 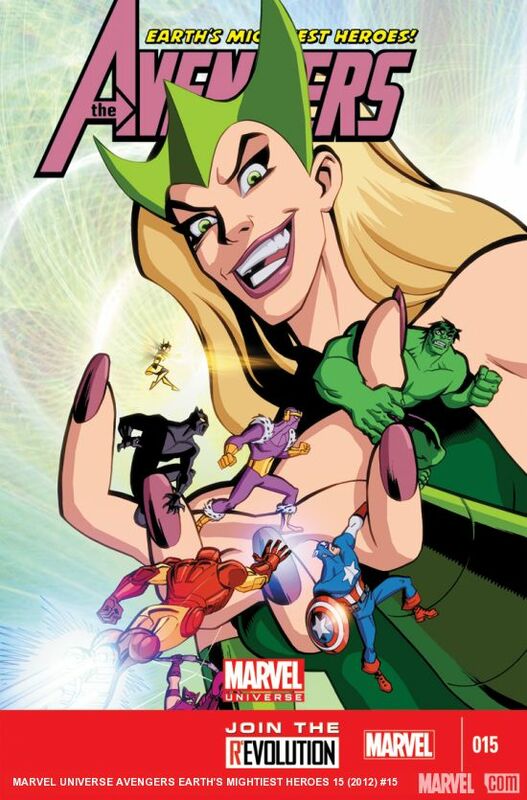 This is the second in a series of three covers I did recently for the comic book tie-in for the Avengers: Earth’s Mightiest Heroes animated TV show. 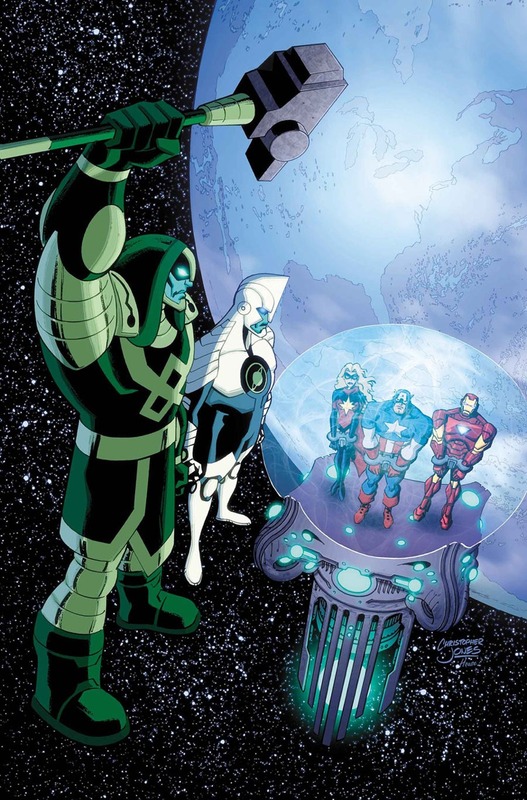 I was told “Let’s go a little more sci-fi here – Ronan and Captain Mar-Vell looking down on Earth, the Avengers preparing to defend it,” and that the Avengers to be included were Captain America, Ms. Marvel and Iron Man. My first thought was to have the heroes in a “ready for a fight” pose with Ronan and Mar-Vell towering over them, looking judgmental. I wanted Earth in the background, which meant that our immediate location needed to be in open space or on a spaceship of some kind. If they were on a ship, what kind of ship was it? 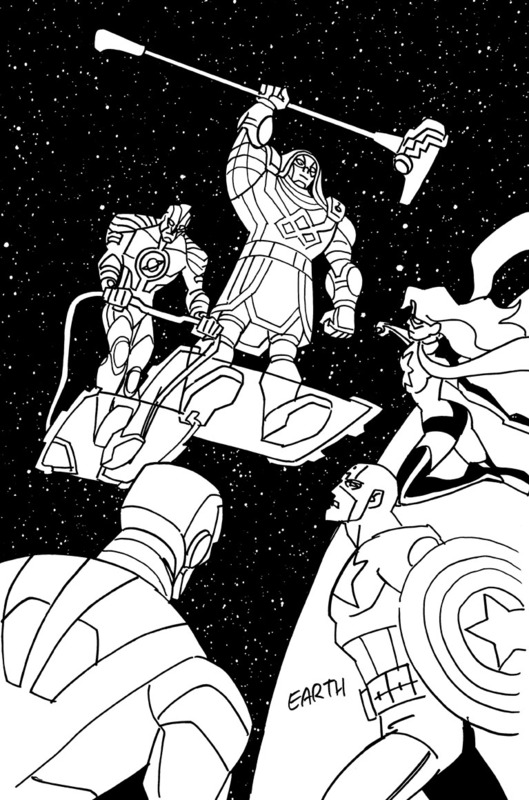 If they were in open space, are the Avengers characters wearing space suits? I was reluctant to solve these problems with specifics that wouldn’t correlate with the actual story. 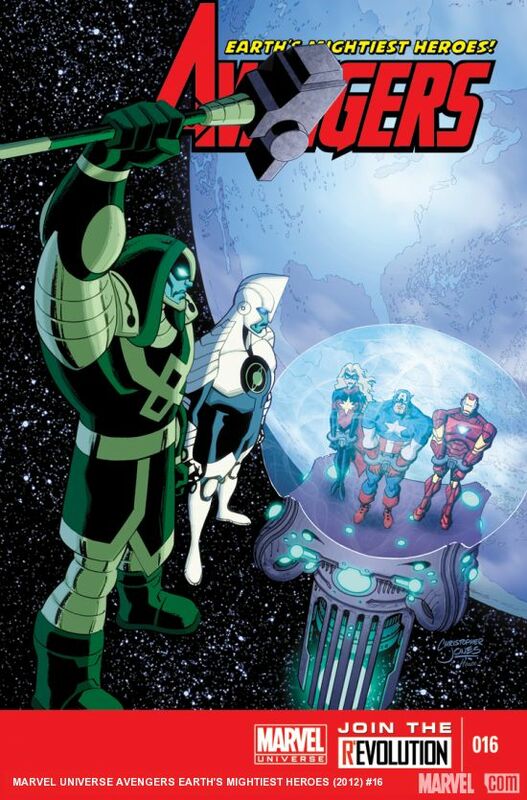 I had a second take on the cover that gave more focus to the story’s “guest stars” Ronan and Mar-Vell, looking from their level down at the trio of heroes on some kind of platform with a protective force field dome and the Earth behind them. 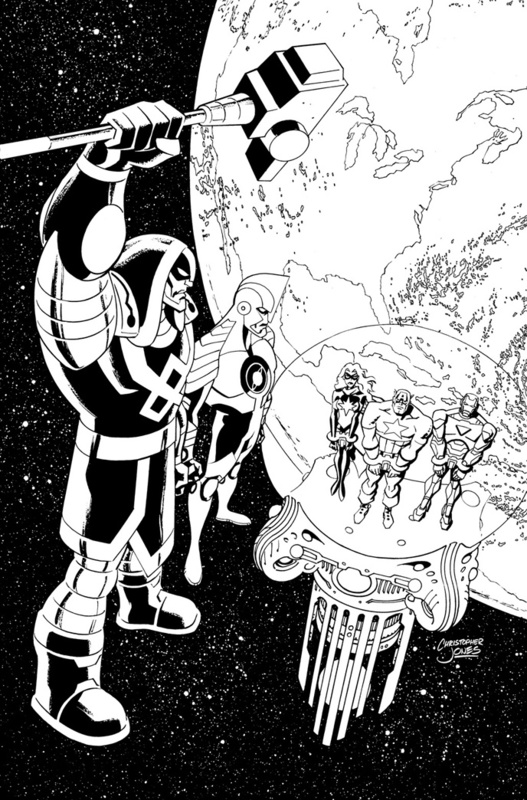 While this platform was likely to be specific only to the cover and not found in the story, this layout seemed to do a much better job of getting across the idea of Ronan and Mar-Vel presiding in judgement over Earth and the heroes. 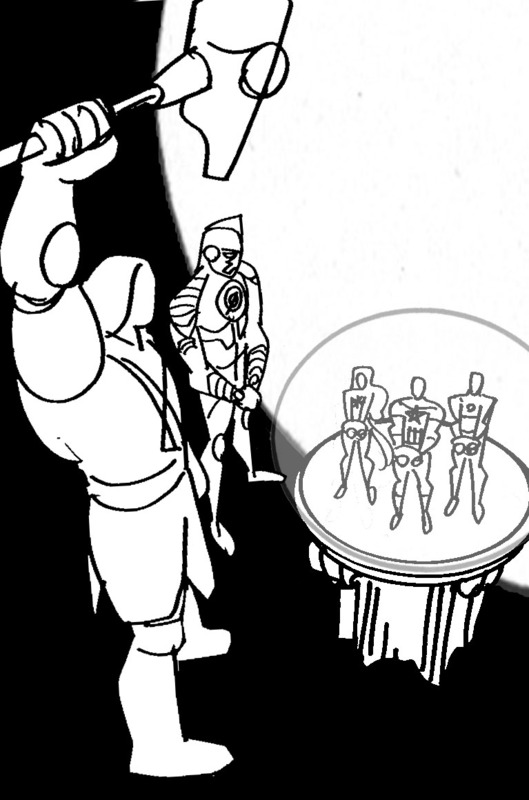 To strengthen this impression I put the heroes in shackles, and tried to make the platform a bit of Kirby-esque space sculpture but also bearing a resemblance to the top of a Grecian column, hopefully further evoking a courtroom ambiance. 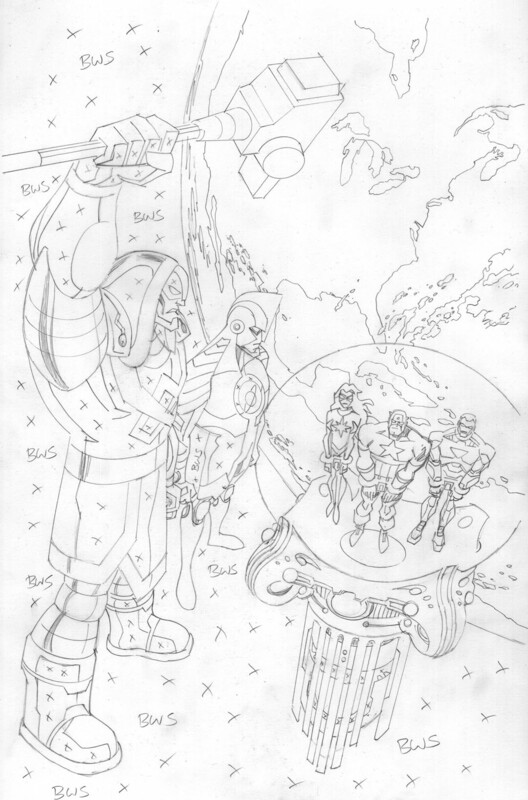 Sketch B was chosen, so pencils and inks were pretty straightforward. 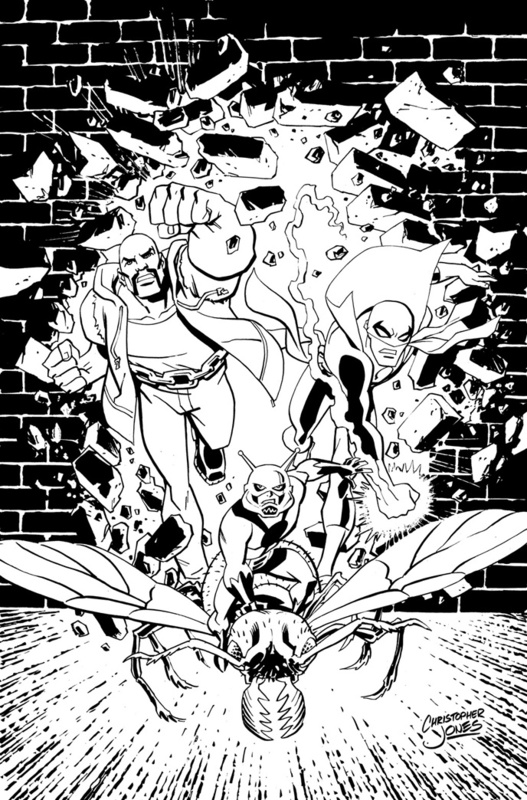 I had a great deal of fun drawing Ronan and Mar-vell, especially.